【High Value 9 Piece】Here we contains more sizes:3Clothing bag,1 underwear bag,1 big toiletry bag,1 Shoes Bag,3 drawstring bag（these drawstring bags can be used as accessories bags, to storage your little things such as cosmetics, daily necessities, socks etc.,),9 choices to meet all your travel needs,makes Your Suitcase Organized,it\'s incredibly satisfying to open your suitcase and know exactly where everything is! 【Updated Travel Packing Cubes】Our Luggage Organizers are made by more thicker,stronger and durable waterproof nylon fabric,double suture,super lightweight and foldable, which can organize your luggage very well and packing Cubes can be used repeatedly.The seams of the Travel packing cubes are very strong and can be used in many trips.This Travel Cubes could be used not just for Luggage Packing Organizers but also for home organizers as well! 【100% Quality Guarantee】All of our products were passed a series of strict quality inspection requirements.Hope all of our customers will enjoy a good shopping experience!Maybe there is some uncontrollable risks during the transportation.if you have any questions, please just contact us by mingludz@163.com, we will give a satisfied solution within 24 hours! 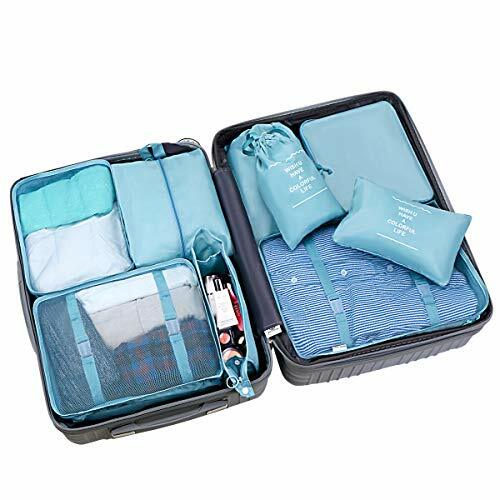 【Saving Space& Keep Neat】Are you still worried about wrinkling of your clothes when travel?our packing cubes contains large capacity, easy two-way zipper and durable buckle,It allows you to easily store and organize your clothing that makes it easy to pack and even easier to unpack. Your clothes will less from wrinkle,like shirt and not get crushed during your travels,hold your items tidy and neat, even if the road bumps, your items will be not messy. it also help to separate your dirty clothes!